“Suicide hotline fights to keep vets and troops alive.” This was the caption in today’s headline news on NPR. It reminds me of a very important issue that deserves discussion–suicide. While suicidality as a result of trauma from war and thoughts of suicide resulting from life’s confusion and stress are on a different experiential level, they share the belief that ending one’s life seems a viable strategy. While professionally evaluating individuals who presented with suicidal ideation, I developed valuable assessment skills that involved asking certain questions. Did the person have the intention to die or did they just want the pain to stop? Assuming the former is the case, did they have a plan for carrying out the action? In exploring the existence of a plan, I would explore whether they had the “means” to carry out the action. Means could involve prescription medications, varying weapons or planning a particular action that would end in lethality, such as a common plan involving a premeditated intention to drive a vehicle off the road. All of this training in adequate assessment not only came in handy professionally, but personally as well. There have been times in my life that I have felt so desperate that I entertained the thought of ending my life. Fortunately, my suicidal thoughts were always in the category of “wanting the pain to stop.” I say this because another axiom I learned on the job was that if someone REALLY wanted to suicide, there is nothing anyone can do stop them. If they readily answered the questions, that was already a good sign that they were willing to change their strategy. I began to see that my own suicidal thoughts came about when I let myself fall to a certain level of Despair. When I got to this point, or fell into this emotional state unconsciously and didn’t distract myself or numb myself into denial, I began to see a significant recurring pattern. I noticed that, before entering a new level of awareness, I would hit a wall of resistance. Everyone has their own particular inner Story or monologue that gets triggered at this moment during one’s emotional arc of Despair. I believe it wise to know what form this resistance takes in order to neutralize its potentially destructive pattern and get beyond it. My words always seemed to be variations of “I just needed to die” for the pain to stop. Granted, this is dramatic, but I specifically capitalize the word Despair when talking about the Great Despair. This is not what one feels when they realize that the toilet paper ran out or they didn’t get into the school they wanted. In the moment after the melodramatic statement was spoken, I would feel a sense of control over a situation that felt uncontrollable prior to the utterance. It seemed that once I verbalized the words, a release could take place and my whole thought process would be transformed. After this happened over and over again, I began to understand the pattern and I would no longer get impressed with the drama associated with the Story. For many people, the inner story could involve what I think of as “the dark side of HOPE.” This must not be confused with true hope. The former is a story one tells oneself as an attempt to “protect” oneself from experiencing the deep, excruciating level of Despair, which could be healed if met courageously. This seeming protection is actually an avoidance tactic. A metaphor that shows this involves a whirlpool. If one falls into a whirlpool and struggles against the force, the person will likely become exhausted and drown. If, however, the person were to let go of the struggle, the whirlpool would simply pull them into the water and deposit them off to the side, yielding a release from the struggle. I don’t mean to infer that this transformational process approaches the kind of trauma the veterans and troops experience. I have worked with a few veterans and others with PTSD, and I suspect the circumstances in Iraq and Afghanistan with multiple deployments are on a level I could not even begin to imagine. I believe our culture has an addiction to violence, as demonstrated by the reliance on war and guns for resolving conflict. With the level of military suicides exceeding the number of troops killed in combat in 2012, as reported by NPR, the causes of violence in our culture are clearly complex. I cannot help but think that when one is trained to resolve external issues through life and death, that one integrates that methodology for resolving internal conflict as well. Perhaps the use of violence as a strategy is what pushes a benign transformational process to the extreme. At some point the issue is no longer about making the pain stop, but about ending one’s life. I cannot help but wonder what in our culture has lead to using violence as a viable strategy. An interesting theory being considered lately has to do with the level of violence that gets imprinted during one’s birth process. In earlier times, before births were reduced to a medical procedure, women would gather in a temple, surrounded by loved ones, and giving birth was seen as a celebration of life. With the utilization of invasive medical interventions such as medications, circumcision and institutional settings, I cannot help but see a connection between the addiction to violence and this initiatory imprint of violence. Perhaps with our increasing collective awareness of violence on many levels, our transformational processes can be more humane. Perhaps as the birth process becomes more about imprinting love and connection, our ways of resolving conflict will reflect those values. And perhaps we can finally, as a culture, begin to subscribe to restorative, regenerative ways of resolving conflict in ourselves and with others. Jordan came to visit me last week and brought me an unexpected and somewhat auspicious present for the holidays. The unforeseen surprise was presented in a small colorful box with images of characters from South Park, the animated television series that is controversial due to its adult themes. Evidently, if you choose a box from the South Park series, the character represented inside is a surprise. I’m not sure how many characters are represented, but there are quite a few to choose from. 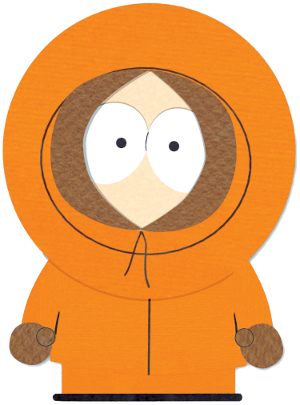 We opened it together and, lo and behold, the character was revealed to be Kenny, the orange hoodie-frocked fourth-grader from South Park, Colorado, who often presents himself with muffled speech due to constriction by the parka. Kenny is the product of an impoverished redneck family, yet he is wise beyond his years. A recurring theme in most of the episodes is that Kenny gets killed off in often gruesome ways, only to reappear in the next episode with no explanation for his disappearance or his gruesome exit. There is little if any reference to a philosophical explanation; he just reappears as if the dismemberment of the previous episode never happened. As if that wasn’t enough, rats would frequently gnaw on his carcass. It is hard for me to watch Kenny and not be struck by the shamanic nature of his recurring death-rebirth cycles. In Crestone, Colorado, there is a strong Tibetan influence and rats gnawing on a carcass reminds me of the Sacred Tibetan teachings of the sky burial practice. Sky burial involves careful preparation of the deceased person’s body, which is then offered on a mountaintop to vultures, who are considered Dakinis or angels. It is believed that Dakinis take the soul to the spirit world. People are encouraged to witness this ritual in order to confront death openly and to deeply integrate the impermanence of life. The impermanence of life has been a central teaching for me since Katrina, when much of my Beloved city was destroyed along with my way of life. My very closest male friend died within two years after we all had moved from Louisiana. My illness progressed steadily after Katrina, we sold the horse farm and moved to Colorado, divorced, and so on. Never had I truly understood the concept of impermanence on an experiential level until then. It is interesting to me that of all the characters on South Park, I was gifted with the presence of Kenny. Whether the writers consciously or unconsciously intended to impart a teaching about the impermanence of life while using satirical humor, the teaching to me is clearly out there, whether it is received or not. In researching for this blog entry, I reviewed many episodes of Kenny and his cronies’ adventures. In one auspicious episode, the writers considered killing Kenny off permanently. The episode involved embryonic stem cells and Kenny contracting a terminal muscular disease. During the episode Kenny died once again, and then after many episodes he finally reappeared. Is it my imagination or is this not synchronistic? Then again, sometimes a cartoon character is just a cartoon character.